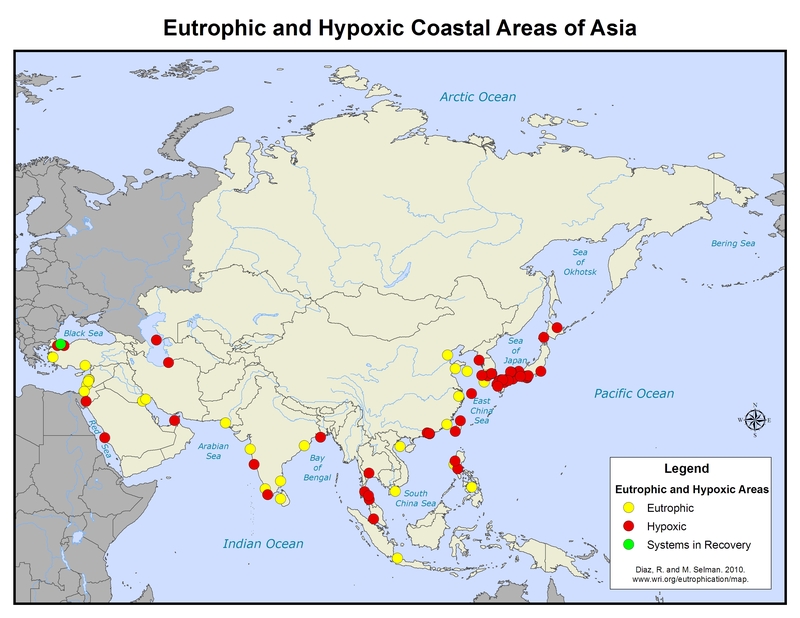 This map identifies just 24 eutrophic coastal areas with documented hypoxia and 9 areas of concern within Asia. Forty-two percent of these areas are located in Japan, where monitoring of eutrophication is well advanced. In China, some hypoxic and eutrophic systems are identified at a coarse scale. For example "South China Sea" and "Bohai Sea" are represented as single points because data were not available at a finer scale. Because of large increases in intensive farming methods, industrial development, and population growth in Asia over the past 20 years, we know that eutrophication and hypoxia are greatly underrepresented in this map. Better water quality monitoring and assessment in China and throughout Asia are needed in order to understand the full extent and nature of eutrophication in Asia.